Prepare grill to medium hot. Soak 6 wooden skewers in water for 5 minutes. Toss shrimp with vegetable oil. Thread shrimp (6 pieces each) onto the skewers. While grill is heating prepare the vegetables for the salad. Rinse Boston lettuce, remove 6 large outer leaves and set aside, chop remaining lettuce. Combine lettuce, green onion, peas, carrots, cucumber and basil with 3/4 cup Jimmy’s Sweet & Sour Salad Dressing with ground ginger. Toss well. Arrange larger Boston lettuce leaves on a platter and top with salad mixture. Spray grill with non-stick cooking spray for the grill. 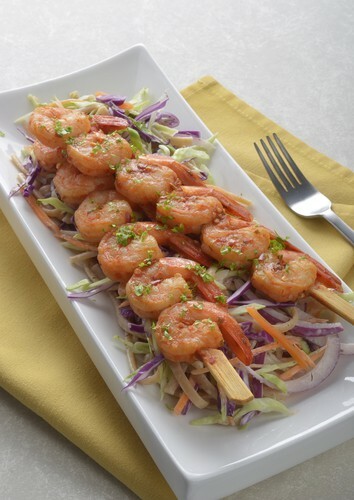 Grill shrimp for 5 to 6 minutes or until shrimp are opaque; turning half way through grilling time, and brushing with 1/4 cup remaining Jimmy’s Sweet & Sour Salad Dressing with ground ginger the last minutes of cooking. Serve shrimp over arranged salad platter and sprinkle with sesame salad topping.